If you are going to start doing inductive Bible study and don’t have a New Inductive Study Bible I encourage you to purchase one. I’ve done the research and Christian Book has the best prices. Click on the link below to see their selection and purchase a Bible. WE WANT TO START OUR STUDY IN GALATIANS BY GETTING A LITTLE BACKGROUND INFORMATION FROM ACTS 13-15. SAUL (WHOSE NAME WAS LATER CHANGED TO PAUL) AND BARNABAS WERE SENT OUT BY THE CHURCH IN ANTIOCH TO GO SPREAD THE GOSPEL TO NEW CITIES. ACTS 13-14 IS THE STORY OF THEIR JOURNEY TO DIFFERENT CITIES AND WHAT HAPPENED IN EACH CITY, WHILE ACTS 15 DEALS WITH AN ISSUE THAT CAME UP AFTER PAUL HAD PREACHED THE GOSPEL IN THESE CITIES. THIS ISSUE IN ACTS 15 IS WHAT ALSO LED PAUL TO WRITE THE BOOK OF GALATIANS. Mark every reference to the word of God in another color or symbol. There are several synonyms to this as well that you need to mark the same color, gospel, word of the Lord, teaching of the Lord, Law and Prophets, etc. 1. What did Paul and Barnabas do when they went into each city? 2. What were some of the different responses to Paul’s message? Do you remember the first time you heard the Gospel? What was your initial response? 3. What was the message of “good news” Paul preached in Acts 13:26-39? Is this similar to the Gospel you heard? 4. After Paul had finished his journey and gone back to Antioch what happened in Acts 15:1? 5. Did Paul and Barnabas agree with what the men in Acts 15:1 were teaching? Why was this teaching such a big deal that Paul had a “great dissension” with them? 6. Where did Paul and Barnabas go and who did they meet with to find out who was right about how to be saved? Why? 7. What conclusion did the apostles and elders come up with in Acts 15:6-11? 8. Are there any works today that people try to add to the gospel in order to be saved? Are you trusting in any work you’ve done to be saved or in Christ and His work on the cross alone? 9. What can we learn about God, Jesus, or the Holy Spirit? 10. What was one of the key verse or verses in this section? 11. Did anything else in this passage stand out to you or bring up other questions? LAST WEEK WE SAW THAT AFTER PAUL HAD GONE AND PREACHED THE GOSPEL AS THE ONLY MEANS OF SALVATION, OTHER JEWISH PEOPLE CAME BEHIND HIM TELLING THE PEOPLE THAT THEY ALSO HAD TO BE CIRCUMCISED TO BE SAVED. PAUL WROTE THE BOOK OF GALATIANS TO PROVE TO THEM THAT THE GOSPEL HE PREACHED WAS THE RIGHT ONE AND THE OTHER MEN WERE WRONG. Read chapters 1 and 2 and mark the word gospel and any synonym for it. (For instance the word another in verse 7 is referring to the gospel. Mark the words man or men and any synonym for it. After you mark all the references to these words, go back and make as many observations as you can about them and write these down. 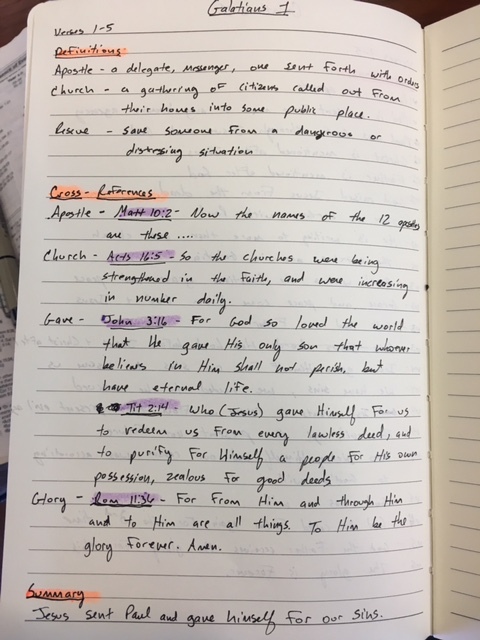 Here is a great example of how to do observations from Lightbearers student michael lee! 1. Why is Paul amazed in verse 6? 2. What word does Paul use in verse 7 to describe what these other men are doing to the gospel? What does that mean? 3. What does Paul say will happen to anyone who teaches a different gospel? Why such strong language and seriousness? 5. In 2:2 what did Paul do with gospel he preached? Why did he do this? What was her fearful about? Why? 6. Who is “them” in 2:2 that Paul submitted his gospel to? Why were these the ones he went to? -What does this tell us about the reliability of the gospel he was preaching and we have today? -How important is it for us today to make sure we believe the right gospel and are sharing the right gospel? 8. What can we learn about God, Jesus, or the Holy Spirit? 9. What was one of the key verse or verses in this section? 10. Did anything else in this passage stand out to you or bring up other questions? LAST WEEK, WE SAW THAT PAUL DROVE HOME THE POINT THAT HE DID NOT GET THE GOSPEL HE PREACHED FROM ANY PERSON, BUT STRAIGHT FROM JESUS. THIS WEEK, WE WANT TO LOOK FURTHER INTO THE EXACT GOSPEL THAT PAUL WAS PREACHING, HOW HE CONFIRMED IT FROM THE OLD TESTAMENT, AND SOME OF ITS IMPLICATIONS. 2. In verse 2:21, what is Paul’s point if our righteousness/justification could come from the law? 3. How did the Galatians receive the Spirit in 3:2? Cross reference this with Acts 15:7-8 and Romans 10:14-17. If people today are going to be saved what must we do? 4. What Old Testament person is given as an example of being justified by faith? In verse 3:17 how many years after Abraham was justified by faith did the Law come? Why is this important? 5. Chapter 3:9-10 contrast people who trust in works to be saved and people who trust in Christ to be saved. What word describes those who are “of faith” and what word describes those who are “of works of the Law”? What made it possible for us to be redeemed from the curse? Do people today trust in works to be saved? 6. In verse 3:19 what reason does Paul give for God giving the Law? For how long was the Law to be in effect? 7. How does the Law play a part in our salvation in verse 3:24? How does the Law do this? 8. In verse 3:26 what is something else that happens when we place our faith in Christ. Can you find a cross-reference in John 1you can think of that talks about becoming children of God? LAST WE SAW THAT PAUL’S GOSPEL OR GOOD NEWS WAS THAT WE ARE JUSTIFIED OR MADE RIGHTEOUS BEFORE GOD BASED ON OUR FAITH IN CHRIST AND NOT ON ANY WORK THAT WE HAVE DONE OR CAN DO. PAUL GOT THIS GOSPEL STRAIGHT FROM JESUS AND AFTER YEARS OF MINISTRY WENT TO JERUSALEM TO MEET WITH THE ORIGINAL DISCIPLES/APOSTLES AND CONFIRM THAT IT WAS CORRECT, WHICH THEY DID. SO WE TOO CAN HAVE CONFIDENCE THAT IF WE ARE TRUSTING IN CHRIST AND HIS FINISHED WORK ON THE CROSS AS THE PERFECT PAYMENT AND SACRIFICE FOR OUR SINS WE TOO HAVE BEEN JUSTIFIED OR DECLARED RIGHTEOUS BY GOD AND HAVE BECOME CHILDREN OF GOD. 1. In verse 3:2 what are the two options for how the Galatians received the Spirit? How do you think they received the Spirit? Does this line up with what Peter says about how the Gentiles first received the Spirit in Acts 15:7-9? Why does Paul ask them this question and also a similar question about the Spirit in 3:5? 2. In verse 3:3, we see that the Galatians did have the Spirit, but now they are trying to do what? Is it possible for us to make ourselves any more perfect than Christ already has? Does this mean it’s possible for us to start following false teaching after we have been justified and given the Spirit? Is this something we need to be aware of today? 3. In verse 3:14 what was there a promise of? Cross Reference this with Ezekiel 36:27, Luke 24:49, and Acts 2:33. How are we to receive what was promised? 4. In verse 4:6, where does God send His spirit and what does His Spirit lead us to cry? What implications does the word “Father or Daddy” have? Has your relationship with your earthly father made it easy or hard to see God as Father? Why or why not? 5. In verse 4:7-9 what does it say we were before we were sons/children of God? What is the difference in a slave and a son? Are these believers at risk of being enslaved by worldly things again? What were some things in your past that has had control over you? Are you tempted to go back to these things now? 6. What does God want us to have in verse 5:1? What are we free from having to do and what are free to do? 7. In verse 5:5 what those who are now children of God and have the Spirit waiting on? What does that mean? 8. In verse 5:6 what is important to God while we are waiting on Christ to return? What is the difference of “In Christ...faith working through love” and “works of the law to be justified?” So what works are we who are “in Christ" and "have the Spirit” to be doing? 1. Last week we say in 5:1 that “Christ set us free” and discussed some of the implications of that. In verse 5:13, Paul picks up on the theme of our freedom again. What is Paul warning these believers not to do with their freedom? Does this mean that as believers we can still act in our flesh? 2. In verse 5:16 what is Paul’s remedy to keep believers from carrying out the desires of the flesh? How do we walk in the Spirit? 3. Verse 5:17 tells us two things are in opposition to each other in the life of a believer. What are they? Cross reference this with Romans 7:14-25. Do you feel this battle in your own life? What are some examples? 4. Verses 5:19-21 talk about the actions that come from the flesh. Is it possible for a believer to struggle with these things? Is there something on this list that is more of a struggle for you? 5. Verses 5:22-23 talk about the fruit that comes from the Spirit. Do you see evidence of these fruit in your life? 6. In verse 5:24 what does Paul say those who belong to Christ have done? How is this possible when 5:26 instructs us in sins to avoid and 6:1 tells us how to respond to believers in sin? How can the flesh be crucified and be fighting against us at the same time? 7. In verse 25 how do we live or have life? If we have life by the Spirit what else should we do? How do we do this? Is it possible for us not to walk in the Spirit? 8. In verse 6:7 what does a person reap when they sow to their flesh? What are some ways we sow to our flesh? What do people reap when they sow to the Spirit? What are some ways we sow to the Spirt? 9. While we struggle with this battle between flesh and Spirit can we be assured of our salvation? Why or why not? 10. What can we learn about God, Jesus, or the Holy Spirit? 11. What was one of the key verse or verses in this section? 12. Did anything else in this passage stand out to you or bring up other questions? LAST WEEK WE SAW THAT WE WHO ARE CHILDREN OF GOD AND HAVE THE SPIRIT, STILL HAVE A BATTLE ON OUR HANDS. CHRIST HAS SET US FREE FROM HAVING TO WORK TO EARN OUR SALVATION AND SET US FREE TO OBEY HIM AND NOT OUR FLESH. AS LONG AS WE ARE IN THIS BODY WE STILL HAVE OUR SINFUL NATURE, AKA THE FLESH. THE FLESH AND THE SPIRIT ARE IN OPPOSITION TO EACH OTHER, ONE LEADING US TO ACT THE WAY GOD WANTS US TO, THE OTHER LEADING US TO ACT THE WAY THIS WORLD AND SATAN WANT US TO. WHICHEVER ONE WE FEED THE MOST WILL BE THE STRONGEST, SO WE MUST BE FOCUSED ON FEEDING THE SPIRIT IN ORDER TO BE LED BY THE SPIRIT AND HAVE THE FRUITS OF THE SPIRIT ON A REGULAR BASIS. 1) In verse 1:3, where does grace come from? 2) In verse 1:6 and 1:15 we see that the Galatian believers and Paul were called by what? How? Did Paul do anything to deserve God’s grace? Does anyone? Are we also called by God's grace? How does this truth impact you? 3) In verse 2:21, what would being made righteous through the law nullify or make void? Why? Do we have to do anything in order for God to give us grace? What makes it possible for God to give us grace? 4) In verse 2:9, what did James, Cephas, and John recognize about Paul? Could grace be grace if it wasn't given but worked for? Why is this important for us to understand? 6) In verse 6:18 Paul closes the letter by telling them the grace of Christ be with what? How can God's grace be with our spirit? Last week we looked at the word grace. What a wonderful, life changing word. I'm not sure if you're like me, but I didn't really understand grace when I was young in my faith. once I began to understand it, so much thankfulness and love toward God filled my heart and it still does daily. We are so undeserving of anything except death and separation from God, yet He shows us grace; giving us love and forgiveness instead of justice and wrath. what Jesus went through to take that wrath in our place and make it possible for God to give us love and forgiveness is just amazing...guess that's why they call it amazing grace! 1. Make a list of at least 5 additional observations for each section. 3. Look up 3 cross-references for each section on some of the main words used in each section. 4. Summarize the section in your own words doing your best to use ten words or less. This is an example of observations. DO THIS FOR EACH SECTION. this is an example of definitions, cross-references and a summary. do this for each section. When you are done with all the sections, summarize the first chapter in your own words. When you meet with your mentor this week, talk through each section and share what words and cross references stood out to you, as well as any questions you had. Remember the point of doing this is to help you learn to make more observations, understand the words that are used, see other places they are used in the Bible, and learn the flow of Paul's thoughts throughout the letter. As you study more, try to make it as personal as possible. Think how different verses apply to you and share these thoughts when you meet. When you are done, you will have an thorough understanding of Galatians.